First please note the cheapest way to start is to check if your mower blades are damaged. This may cause the battery to drain faster and be the real cause of excessive battery drain. I ordered a "2 Pack - USA Mower Blades® 18-1/2" x 1-3/4" x 0.152, 1" Center Hole Residential fits Black & Decker® CM1936 CM1936ZF2 SPCM1936 90541433-01" off of ebay for $17.99. My blade needed to be replace so I figured this would be better to try first before spending money on a battery. In my case the blades were not the issue. 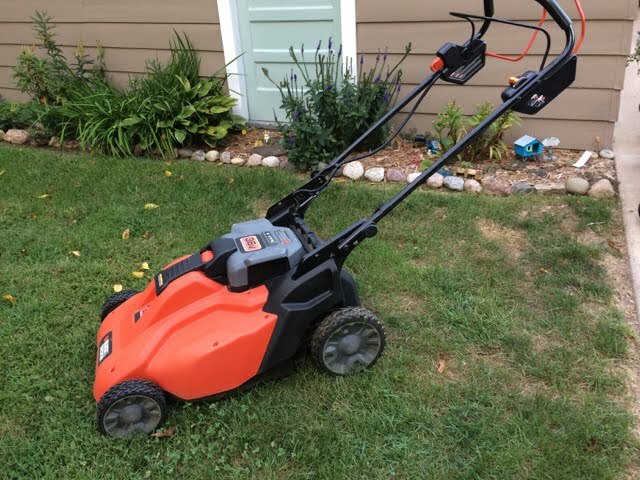 By this point you are probably fed up with the Black & Decker battery powered 36v mower. It is no longer cutting all of your crabgrass like it used to. Plugging in between the front and back lawn over two days isn't the most efficient way to mow. 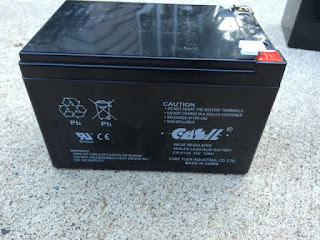 You could buy battery complete for around $130 or you can spend a little time and take apart your battery you have now and just replace the 3 batteries that are inside the case. 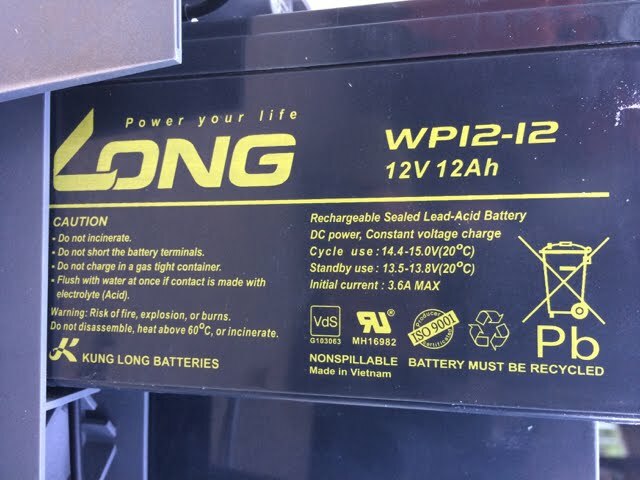 The batteries that were inside my battery case were 3 Long WP12-12 12v 12ah batteries. 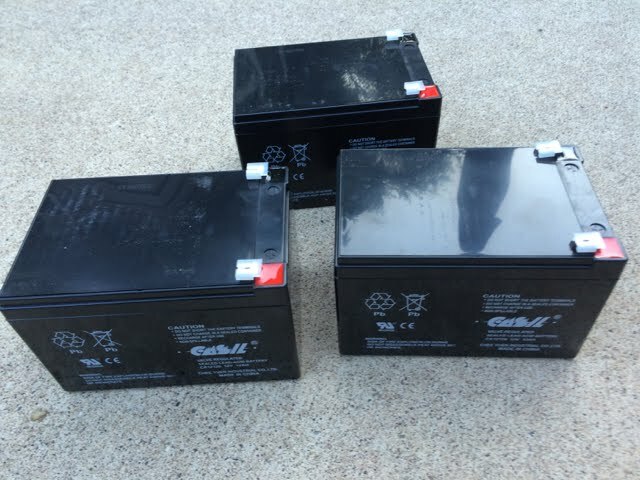 I ended up buying a set of 3 Casil CA12120 12V 12AH batteries off of ebay for $60 total that were an exact match for the old batteries. Proceed at your own risk from this point on. 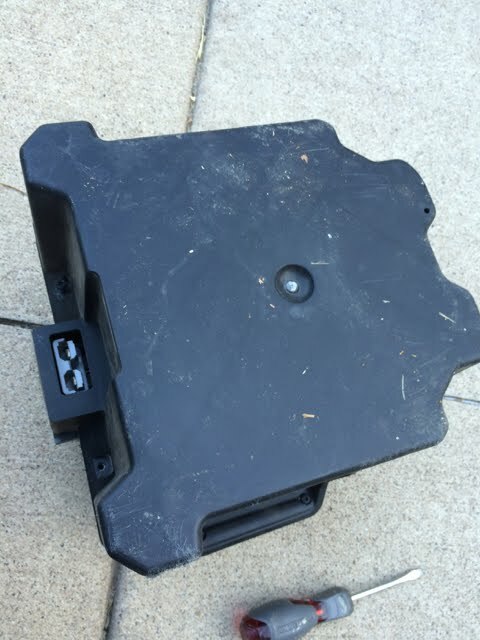 To open the battery case you only need to use a standard screw driver and remove all the screws from the bottom. Now the hard part is when you separate the two halves of the case be sure to note what cables go where or you will have a bad time getting this back together and could possibly pinch a wire in the process. 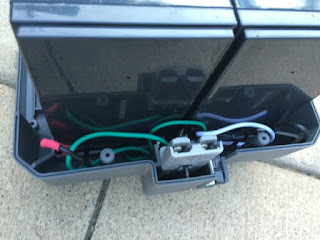 Some of the wires sit in slits to keep the wires from being pinched by the heavy batteries. You may need to you a needle nose or screw driver to remove the plug from the terminals. 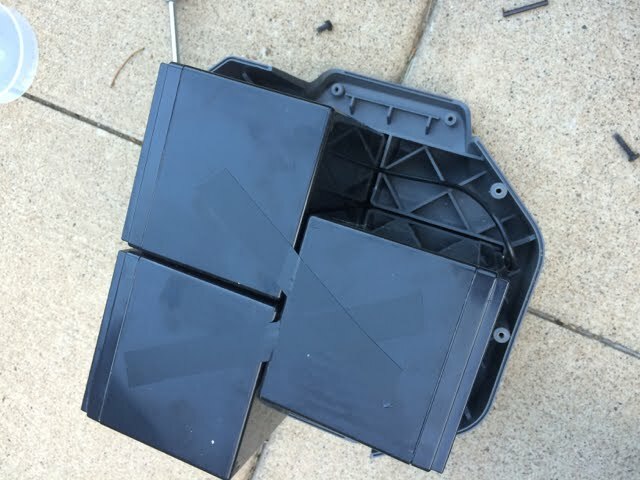 The batteries with be taped together. Copy the wiring and battery configuration with the new batteries. Be sure to tape the batteries together to minimized battery movement. Once everything is in place screw the case back together and give it a try. You may have to do a complete charge before you use it to see battery life similar to the original battery life. After building a Moog Etherwave Standard Theremin kit I had some questions about the correct tuning of this theremin. 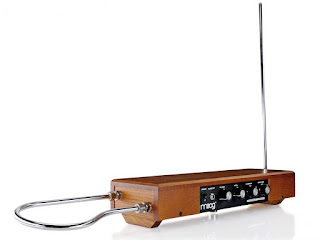 I was sent this informal instruction on tuning a Moog theremin. Hope this helps any one else with questions. Set the volume knob on the control panel to 3 o'clock. Stand as far to the left (pitch side) of the unit as possible, so you are away from the volume antenna. With the unit powered on and hooked up to amplification, reach over with the trimmer tool and start turning L11 through its range. Somewhere in the middle, you should hear a sound start to be audible, reach a maximum loudness, and then die off again. Turn the lug back to the point where the sound is loudest. This should put it in the correct range, to where the sound is silent when your hand approaches the antenna and them becomes louder as you draw away; additionally the Volume knob should be set correctly such that it controls not the actual volume but rather the hardness or softness of the volume curve; meaning how quickly the sound reaches maximum loudness as you draw your hand away. At the clockwise extreme it should have a brighter, sharper attack and at counterclockwise the volume should increase smoothly and slowly as you draw your hand away from the volume antenna. Tuning the pitch circuit is really an art in itself. Roughly speaking, L5 controls the "top end" or the highest pitch you hear when you are touching the pitch antenna, and L6 controls the range, or how far from the antenna the zero point (zero beat, or silence) is located. I perform the tuning using a special wooden cabinet top with holes drilled above the variable inductors, because the presence or absence of the top influences the adjustments. It is more difficult when you have to perform the tuning with the cabinet top completely removed, and then listen to it again with the top in place to see if the tuning is still correct. Generally I find the top seems to influence the pitch downwards from what you hear with the top removed; if so in tuning it helps to "tune high" by a bit and then set the top in place to see if it falls into range. Here is my procedure. First, listen to see if the pitch goes higher or lower as you draw your hand away from the pitch antenna. If it goes higher, adjust L5 so that the pitch descends through the zero point and then starts rising again; now it should be in the right direction. 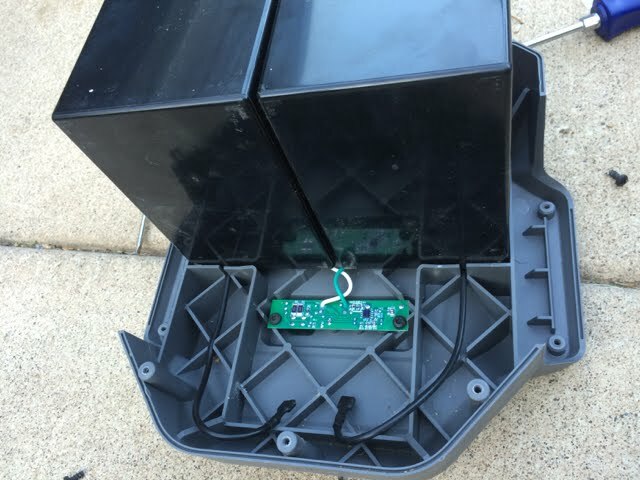 The next step is to grasp the pitch antenna and adjust L5 so that the frequency you hear is in the neighborhood of 3.8 kHz. L5 and L6 interact, so there will be a decent amount of back-and-forth between the two adjustments. Once you have the top end around 3.8 kHz, move your hand away and see where the zero point is located. It will likely be too close (too short a scale range); to adjust, stand at arm's length from the pitch antenna and reach over from the left to adjust L6. You want to adjust it so that the zero point is about an arm's length from the pitch antenna. Generally this involves turning the lug in L6 in the same direction as you adjusted L5 to get the top end. The first time you do this, it will probably drive the top end higher than you wanted it to be, so go back to grasping the pitch antenna and turn L5 in the appropriate direction to get back in the neighborhood of 3.8kHz. Notice which direction it went (higher or lower) as a result of setting L6; and overshoot in the appropriate (opposite) direction to cut down on the number of times you have to go back and forth between the two adjustments. 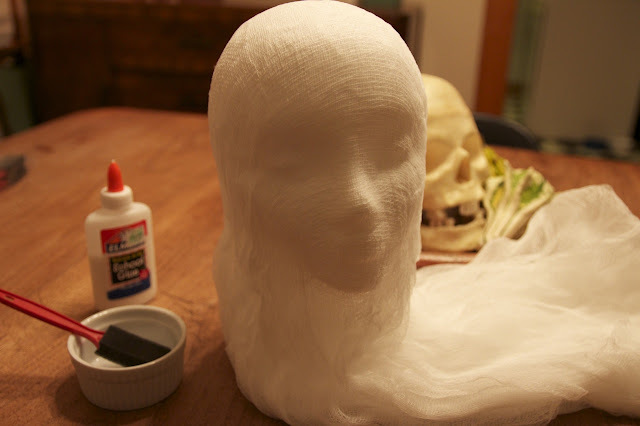 To build this ghost all you need are styrofoam wig heads, cheese cloth, glue, a brush and, an eye hook. First take cheese cloth and make 4 layers of cheese cloth. 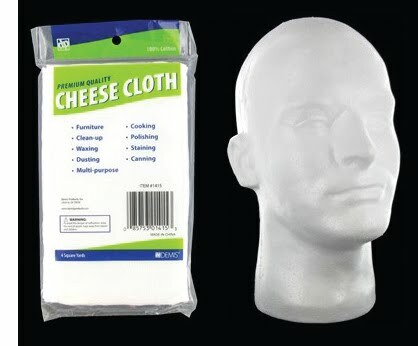 You may need 2 packages of cheese cloth per ghost. 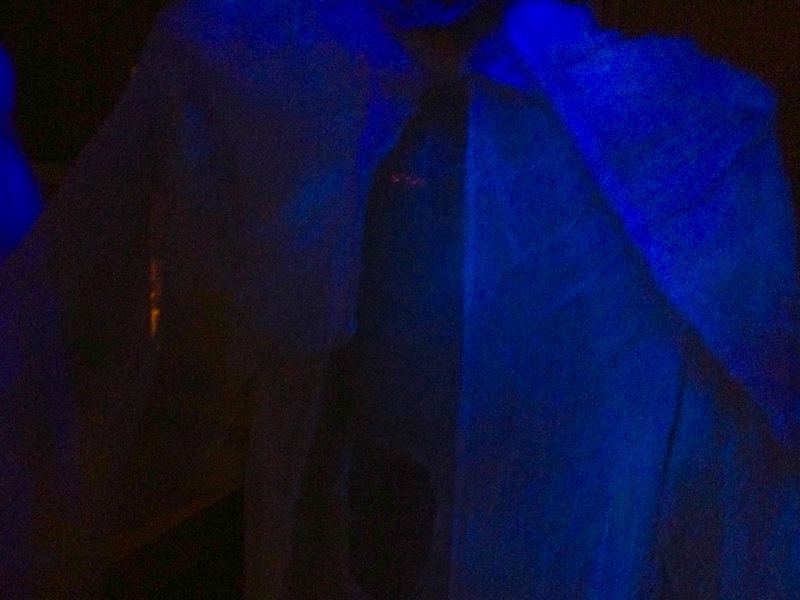 Drape cheese cloth over the styrofoam head. Brush on some glue to expose the mannequins facial features. Leave the neck and under the chin unglued. I used some watered down Elmer's glue and it seams to be holding well, but you may want to go with a heaver duty glue if you will be using them outside. Let it dry over night. 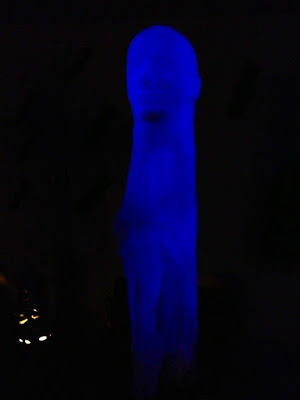 Put an eye hook in the top of the mannequin's head and hang with some fishing line. 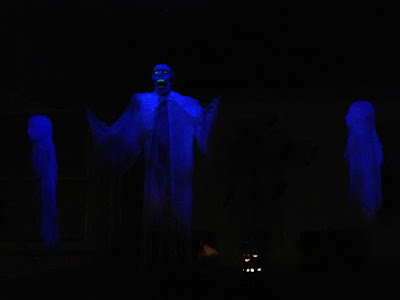 I made three ghosts total and made them black light sensitive for an even better effect. For more information on make your ghosts black light sensitive check out my easy to follow instructions here. 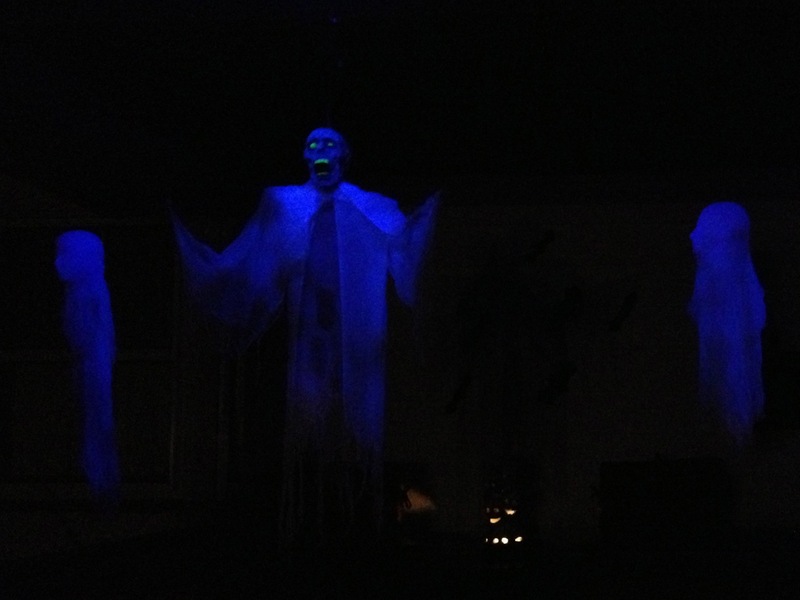 It seams like black lights and halloween decorations should just go hand in hand. 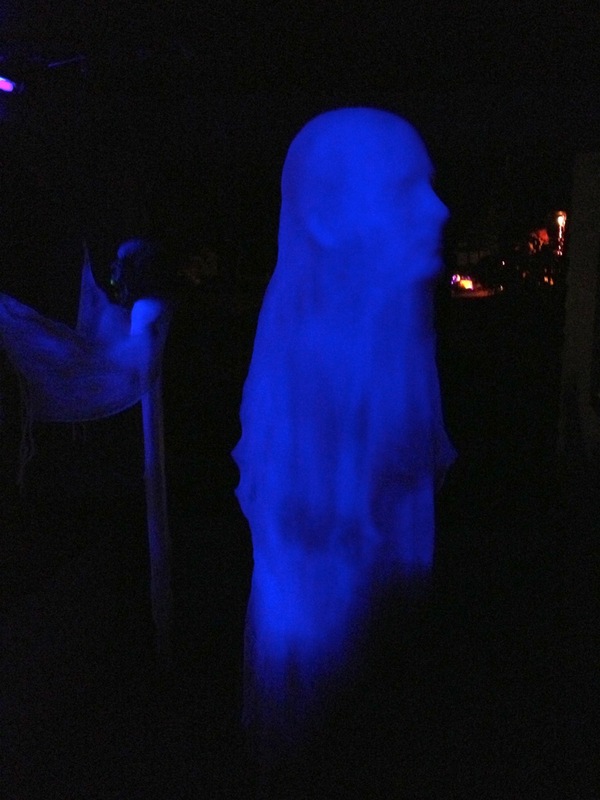 The black light is the perfect option to make a seemingly "realistic" ghost effect. Making cloth ghosts black light reactive is very simple to do and it only takes a short amount of time. What I have found that works best for cheese cloth ghosts is using RIT Whitener brightener which can be found at most craft stores. 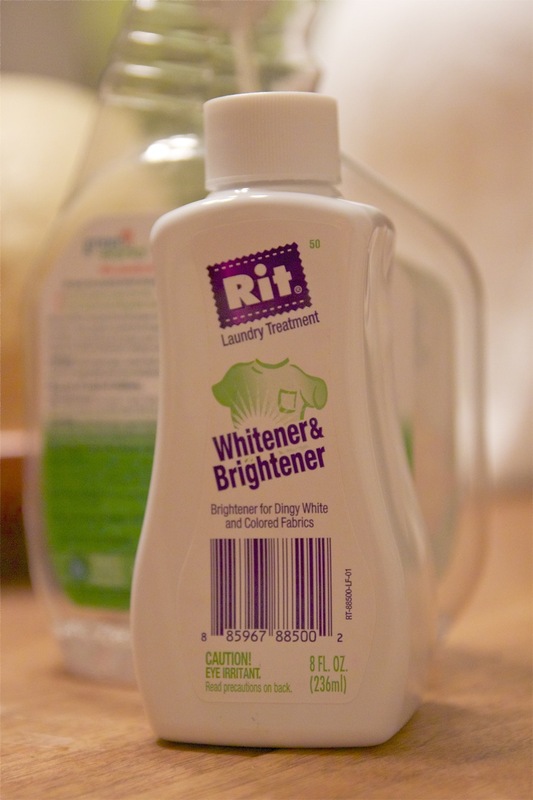 RIT Whitener & Brightener has phosphates that react with the black light also making your laundy whites appear brighter in normal light. To use it all you have to do is mix about a tablespoon of RIT with about 4 cups of water into a spray bottle. The amount doesn't have to be very accurate I'm just expressing you don't have to use very much of the RIT dye. I would recommend spray this outside as it will most likely get every where. Just spray and leave it on, no washing required. I touched up an old crank ghost I've had for a few years. You can see on the right I just sprayed the RIT dye and on the left I hadn't spayed. What a difference. Below is a fix for those who upgraded to iOS 6 and haven't been able to get the passbook app to connect to the itunes app store. Luckly there is a easy but strange fix. 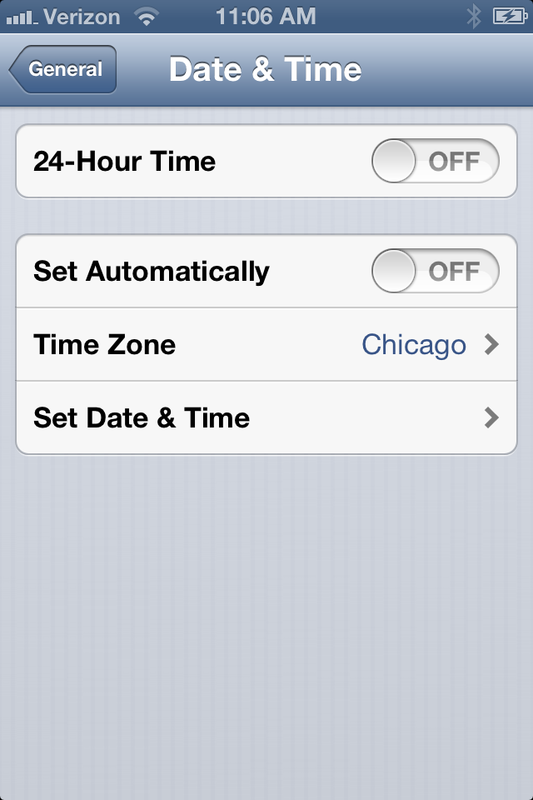 Go to "Set Date & Time"
Open the passbook app and click the app store button. The apps should load now. 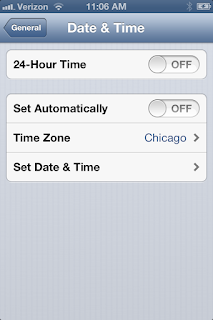 Then go back to Date & Time and turn back on the "Set Automatically" button. 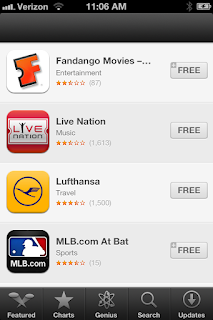 Go back to passbook and everything should still be working. 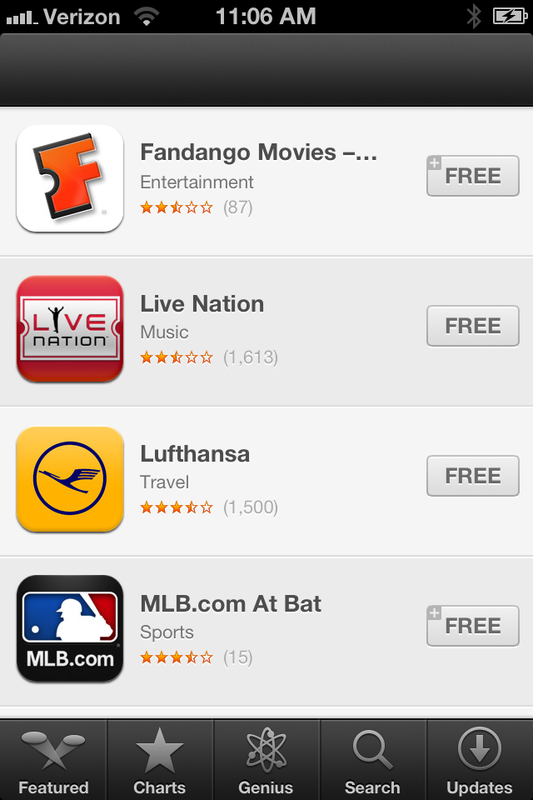 Now if only it was a more useful app right now but I'm sure it will get there. Baby steps to the future. To hide or show hidden files you will need to use apple's terminal application. Terminal is located in the Applications/Utilites folder. Please use at your own risk. Terminal is a very powerful application and can get messy fast and remember not to start deleting hidden files that you think you don' t need. Hit the Return button to activate command. You should start to see files with a . in the start of the name. These files are the normally hidden files. Remember to re hide the hidden file when you are finished. Do you keep getting the "Finished downloading firware for SGH-l717. Check which model you use, and click here to quickly upgrade using previously downloaded firmware" Use the guide below to help fix this issue. Now you should see a few hidden files. Go to your Username/Library/Application Support folder. You will hopefully see a file called ".FUS" just delete that file and you are done. Alternatively you can use an automator action I did awhile back. It's simplistic but works for me. Please use at your own risk. This has only been tested on Snow Leopard but should work on anything released after that OS. I really question Samsung hiding this file in the first place, but I'm glad I was able to figure it out and I hope I can save many others from wasting their time on this. Let me know if this worked for you or if you like my Automator hide show apps.